Zeno Media, an aggregator of broadcast stations specializing in niche a diaspora communities, has launched a new strategic thrust with an agreement with about a dozen Haitian radio brands. Those stations are bundled into an app which provides streaming, Call-to-Listen (Zeno’s founding technology), on-demand content, subscription options, and intellectual property protections. The app helps expatriate Haitians stay in touch with their home radio stations, while expanding station reach and protecting it from piracy. 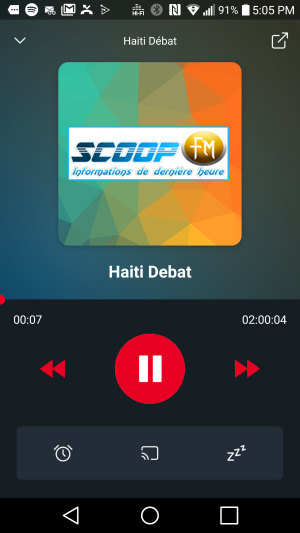 The Haitian Radios app is on Android and iOS, and is purportedly the only way the streams can be heard outside of Haiti. A second, but no less important rationale for Zeno’s endeavor, is that Haitian radio stations are widely pirated. Zeno’s business case involves working to shut down piracy and return revenues to the stations. Our testing revealed a cleanly designed app with no discernible glitches. Before we heard a second of radio streaming we got a pre-roll video ad for Blinkist, the book-summary app. Each radio station opens into its own panel, which includes an alarm feature and a sleep timer for auto-shutdown. The design is clean and easy to understand.